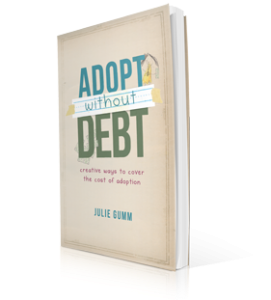 Children's Hope International: Giveaway: Win a Copy of "Adopt Without Debt"! We try to live a debt-free life and would love for our Russian adoption to be debt free as well. We would love to win a copy of this book as we hope to adopt multiple children. I am a FB fan of Childrens Hope International. I am working the Dave Ramsey plan and just paid off my last credit card. I am determined to adopt debt-free but could sure use some extra pointers to help make it possible. We are hoping to adopt without debt from Russia! We are trusting Jesus to provide our every need. He has done so concerning our adoption from Ethiopia! Any additional tools in our bag to help us with our future adoptions and helping our friends who are considering adoption would be delightful! What a great book to write! Financing always seems to be the biggest barrier to adopting. Would live to read this to get inspired & find more ideas. I am currently on the wait list and have thus far managed to adopt without debt. As a single mama I am proud of this fact and would LOVE more tips and tricks on how to continue to adopt without debt. I also commented on FB but we are trying to do our adoption without debt and my sister would love to adopt but doesn't think it's financially feasible so this book could help us both. I am hoping to be a waiting family by the end of the summer. Would love to win/read this book because we have worked hard to get out of major debt and want to keep that goal alive and well even as we adopt, although on a one-income minister's salary is pretty tough. My wife and I want to welcome a sibling pair into our home without the additional constraints of debt stress and financial worry. Anything we can do to prepare our home, such as this book, will be a great aid. We would LOVE LOVE LOVE a copy of this book! We are just beginning our adoption and would love to be able to do it without incurring debt. I am a fan of Children's Hope International on fb. My husband and I have been in the adoption process for 8 years and have spent LOTS of money along the way...as I'm sure all have who are trying to adopt...but we could benefit greatly from this book by helping us with the rest (and final) steps of our adoption. My husband and I are still to young to adopt internationally, but are trying to begin preparing and saving for when the time comes. Hopefully, when we are able to begin the process in a year and a half, we'll have most of the money needed and will be able to bring home several children. We would love to get a copy of this book. We are just beginning to research adoption. We have our winner of "Adopt Without Debt" by Julie Gumm! Congratuations to Anne Marie Bowen, selected by our Random Number Generator. We hope this book helps make your adoption even more affordable!